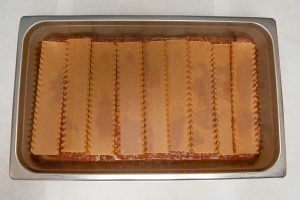 To make breadcrumbs, toast hamburger buns in a low temperature oven (200 degrees F) until slightly golden brown and firm. See recipe MRS 1303, Whole Wheat Bread Crumbs, for detailed directions and photographs of this recipe. In a sauté pan, heat the vegetable oil. Add the sliced zucchini and onions. Sauté for 3 minutes or until tender. Stir in flour and cook for 3 minutes. Remove from heat and set aside. Place broccoli in a full-size steamtable pan (12" x 20" x 2½") and steam for 6 minutes, or until tender. Drain well and add to zucchini mixture. In a braising pan or steam-jacketed kettle, heat the tomato sauce and tomato paste. Add the oregano and garlic powder. Simmer, uncovered, for 30 minutes. Add the sautéed vegetables and steamed broccoli to the tomato sauce. Stir to combine. Simmer for 10 minutes. In a large bowl, combine the low-fat cottage cheese, dried parsley, garlic powder, and bread crumbs. Mix well. Combine parmesan cheese and mozzarella cheese. 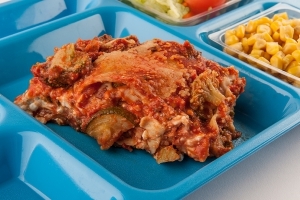 Spread 1 cup of vegetable sauce on the bottom of each steamtable pan to prevent sticking. For 50 servings, use 2 pans. Cover with plastic wrap and aluminum foil. 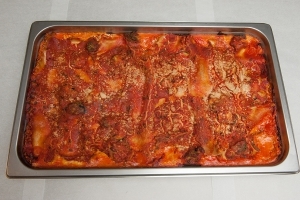 Lasagna may be baked or refrigerated and baked the next day. 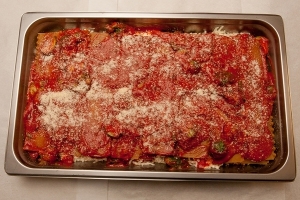 If lasagna is baked the next day, quick chill within 6 hours to 41 degrees F or lower. Conventional oven: 375 degrees F for 50 minutes. Convection oven: 350 degrees F for 40 minutes. Bake until bubbling and heated through. 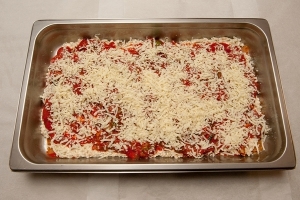 Remove from oven and allow to set for 15 minutes before serving. Cut each pan 5 x 5 (25 servings per pan). Portion 1 square for each serving. Each portion provides 2 oz. eq. meat/meat alternate, 1 oz. eq. whole grain, ¼ cup dark green vegetable, ½ cup red/orange vegetable, 1/8 cup other vegetable. 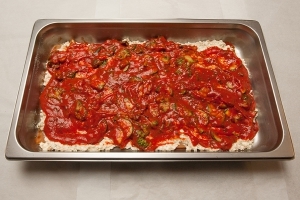 1 quart of cottage cheese mixture covered by 1 quart 1 cup vegetable sauce over the 1st layer of noodles. 2¼ cups cheese mixture covering the vegetable sauce. These steps are repeated for the second and third layers.